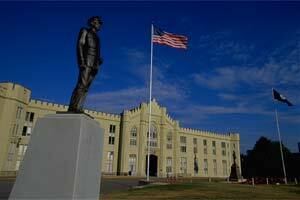 Lexington is is home to Virginia Military Institute and Washington & Lee University, which contributes to a high level of cultural activity in the community. A variety of athletic events are also open to the general public. The summer months bring the popular Lime Kiln Theatre productions. History buffs can enjoy the Stonewall Jackson House, the George C. Marshall Museum at VMI and the Lee Chapel.